In Lana Jokel’s 1972 film monograph on Andy Warhol (Blackwood Films), the artist is asked to conjecture what he considers will become the next major international art movement. With his voice stammering a little under the weight of the question, Warhol responds in a familiar affected manner with “ah…it’ll be…ah…p …. po…pol …political art……” The last forty years have in fact proved Warhol right in several senses outlined by Sholette in this recent book, provocatively titled for the neoliberal age: Dark Matter: Art & Politics in the Age of Enterprise Culture. Post-1972 art has indeed become deeply political, both in what we could term its art market capital affirmative characteristics (East Village, YBA artists, Saatchi and Saatchi, international Biennales, the vertiginous art market), and its anti-capital critical manifestations in the work of an international reserve army of hundreds of marginalized, invisible cultural workers, political artists and groups, many of whom sent New York-based PAD/D (Political Art Documentation / Distribution) examples of their art political activities for over a decade. It is deeply ironic that this rich archive is now part of the collection of that bastion of high culture, the Museum of Modern Art in New York City, and now available for researchers like Sholette who are attempting to discern the trajectories, successes and failures of political art projects. As a founding member of PAD/D and REPO history (1989-2000), a collaborative group of artists practicing sign interventions aimed at constituting and repossessing lost and hidden histories in urban contexts, Sholette has had an insider’s view for over two decades of the art world and its discontents. He employs his participant observer’s experience to formulate some powerful critiques of art world hierarchies and institutions, revealing the role of artists, described by the author as “the obscure mass of “failed” artists” (3), and the “dark matter”—the reserve army of surplus labour in Marx’s famous thesis—who sustain and reproduce the global art world. Throughout its eight chapters this book provides some well-argued insights into the ideological struggles and forms of resistance that have played out in various, mostly urban communities. Sholette explores examples of political agency manifested in artworks and group actions that have challenged the hegemony of the art world if only to be forgotten and marginalized, a minority co-opted and absorbed by the culturally dominant institutions. Borrowing the physical sciences’ metaphor of dark matter as his unifying allegorical trope, the author conjectures that “without this obscure mass of ‘failed’ artists the small cadre of successful artists would find it difficult, if not impossible, to sustain the global art world as it appears today” (ibid.). Sholette argues further that without the “invisible mass, the ranks of the middle and lower level arts administrators would be depleted, [and] there would be no one left to fabricate the work of art stars or to manage their studios and careers.” “And who,” he asks rhetorically, “would educate the next generation of artists, disciplining their growing numbers into a system that mechanically reproduces prolific failure?” (ibid.). This observation would be depressing enough if the avant-garde did not have the concept of failure directly inscribed within its fabric. Capitalist society’s conventional indicators of artistic success are readily indicated by the accumulation of both material and symbolic capital, awards, certificates, diplomas, prizes, profitable sales, goods and property. The artist and his/her work become the subject/object of critical legitimation and valorization in newspapers, magazine reviews, journal essays, catalogues and books. S/he may also be offered honorary appointments and awards, etc. But these evaluations are intrinsic to success. The succès de scandale that with épater le bourgeois was a key social objective of the historical avant-gardes may be the only example of a success that includes in its very definition a measure of failure (scandal) that is ipso facto also perceived as success. The value of success however, like the value of beauty, the sublime and pleasure, which we know from Kant, is necessarily a question of judgment, about which Jacques Derrida has posted a signal warning. “Where is it to be found? This then, appears to be a/the question. Where indeed, is it to be found? Where is the limit between the inside and outside of failure?” (45). Reading this book awry, Dark Matter may simply be an acknowledgement that the art world is a Ponzi-like pyramid scheme with artist players, payers and prayers at its base, symbolically and economically paying forward and upward to the accumulators of symbolic and actual capital aggregated at the apex: the mega art stars, gallerists, collectors, publishers, art critics and art historians. Sholette, however, is supremely aware of the political nuances in his prognoses, offering less a symptomology of a degraded art world than culturally strategic vehicles for critiquing capitalism that could be used as political models by the Occupy movement of today. As Sholette opines, “What is described in these pages as “dark matter” therefore, is not intrinsically progressive, not in the typical liberal or radical senses of that term.” Instead, he argues, “it possesses at best a potential for progressive resistance, as well as for reactionary anger” (44). Sholette’s Marxist critique describes the artist agents and collaborators of Dark Matter as engaging in “hidden social production, missing mass, shadow archive,” a reserve ‘army of labour’ without which the art world would simply collapse under the weight of its own contradictions (45). The author infers critical agency to this dark mass of invisible, surplus, yet essential artists who provide the shadow glue for the reproduction of the global art world. They are, he writes, “a presence/absence of a vast zone of cultural activity that can no longer be ignored.” Sholette argues that although the artists within this shadow mass may be practically and perhaps therefore tactically invisible, “no amount of uncertainty relieves us of the responsibility to engage with them politically, as an essential element in a long standing promise of liberation yet to be fulfilled” (45). Chapter 2, “The Grin of the Archive” offers a Derridean-inspired examination of PAD/D providing insights into its importance as a counter culture archive, less a product of archive fever than an active model for networking and political organizing throughout the 1980s, and hence for Sholette “a Cheshire grin without the cat” (70). Some readers may remember PAD/D’s SECOND Sunday programs of performance at Franklin Furnace, meetings held on the third Sunday of every month at 339 Lafayette Street in NYC, where ideas for developing new strategies for practicing cultural activism in NYC and beyond were fomented. PAD/D’s support of the 1984 “Artists Call against U.S. Intervention in Central America” had an active base of support around the world and particularly in Canada.. Chapter 3, entitled “History that Disturbs the Present,” is an excellent insider report of the activities of REPOhistory, followed by in depth discussions of Temporary Services. Chapter 4, “TM”—Tactical Media, not as in the 1960’s Transcendental Meditation—discusses DIY practiced by Public Collectors.org, Temporary Services and the large and growing group of interventionist collectives groups, and cooperatives the Critical Art Ensemble, Wochenklausur, Ala Plastica, Supeflex, subRosa, and other progressive political art groups (see list on p.107). With the introduction of social networks like Facebook, Twitter, Flickr, WordPress and MySpace in the 1990s, Sholette argues that in the contemporary world everything previously “marginalized, overlooked, or made redundant, requests our attention” (95), but inevitably such networking and sharing of the ‘invisible’ archive simple ensures that everyone has their fifteen minutes of fame only to sink back into obscurity and the precarity of the Dark Mass. Temporary Services (TS), described as “a Midwestern artists group dedicated to erasing the distinction between professional and everyday acts and creativity through archives, exhibitions, publications and public interventions” (99), is presented by Sholette as one of the few tactically efficient groups resistant to incorporation and or absorption into the cultural dominant. After laying out in chapter 5 “the depressing conditions of glut, overproduction and redundancy in the art world, everything from the market to the expansion in numbers of art graduates (BFA and MFA), Sholette describes the redemptive prospects of some exemplary dark matter practitioners—for example, the détournements, gift artists and DIY valorizers of everyday life, those following the tactical example of Michel de Certeau. As he posits, “in an age of deregulated aesthetic practice such dark matter inevitably intervenes within the valorization process of official artistic production” (99-100). Employing Nietzsche’s powerful notion of ressentiment and creative negativity (Genealogy of Morals), Sholette argues that the subversive impetus of the agents of dark matter is a poisonous gift and a bottom-up counter-institutionality: “indeed the archives, public projects, exhibitions, and publications of Temporary Services, PAD/D, AWC, Critical Art Ensemble – and for that matter even the presence of this book – would probably not be conceivable without the creative negativity made possible by a shadowy ressentiment.” (113). Chapter 6, entitled “The Unnamable,” discusses at length the protracted legal struggle of Steve Kurtz of the Critical Art Ensemble, who with his scientist colleague Robert Ferrell was arraigned under the auspices of the U.S. Government’s Patriot Act on charges of bioterrorism. The author describes the chill that this sent through the art world, similar to the McCarthy virulent anti-communist witch hunt of the 1950s and the community response to pay for their legal expenses and to exonerate Kurtz. This is followed by a discussion of Tactical Media theory as practiced by groups like CAE, ACT-UP Gran Fury and DIVA TV whose interventionist strategies challenged the homophobic reactions to the AIDS and HIV crises. As Sholette demonstrates throughout his book, the archival, historical redemptive projects of many interventionist, tactical media, operative, and littoral art groups owe a debt to the historical avant garde: dada, futurism, surrealism, productivism/constructivism and also the neo avant-gardes such as situationism, pop, minimal and conceptual art. “TM’s most articulate predecessors, the Situationists, sought a total negation of day-to-day fragmentation, not through the institutions of art, which they saw as dead, but through a process of turning artistic practices outwards and against monopoly capitalisms spectacularization of day-to-day reality” (146). 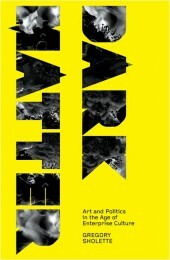 The critical, and one could say, philosophical impetus behind many political art groups described in Dark Matter is derived from the Situationists and strategically their critical procedure of détournement (diversion) that is conceptually allied to Walter Benjamin's concept of allegory. At several points Sholette invokes Benjamin’s work, associating his media critique with the critical agency of tactical media. The critical impetus of TM is closer perhaps to Benjamin’s than is either John Heartfield’s anti-fascist montages or the process/technique and forms that art theorist Peter Bürger (1984) employed in his influential arguments for sustaining the legitimate and authentic work of the avant-garde—art/life sublation—and critical procedures that resolve the contradictory features of normative avant-gardist practice that capitulates to bourgeois intentions. The Situationist notions of distantiation and decomposition (the destruction of conventional cultural forms), that are both implicitly and explicitly endorsed by many artist groups discussed in Dark Matter parallels the ‘surrealist inspired’ tropes that Benjamin employed in his discussion of allegory. The emphasis on meaning ‘substitution’ or ‘sublimation’ as a prelude to critical consciousness in Guy Debord and Gil Wolman's conception of premonitory détournement is also a form of critical redemption that is similar to the historical distantiation and quest for transcendence elaborated in Benjamin's theory of allegory. Dark Matter may be compared also Guy Debord and Gil Wolman's conception of cultural exhaustion and the oppositional use of the strategy of détournement to resist and overcome this symptom of monopoly capitalism finds its homiletic in Walter Benjamin's “profound fascination of the sick man with the isolated and insignificant [is] succeeded by that disappointed abandonment of the exhausted emblem” (Benjamin, Origins 166). For in both strategies, the symptoms, or better, the `syndrome' of alienation, is seen as responsible and responsive – the pharmakon – “poison and drug” for both the sickness and the cure. Subsequently for Benjamin, Debord, Wolman, and arguably Sholette, critical consciousness comes only to those who have realized their own alienation as a part of the political (collective) present. For Benjamin, redemptive criticism, and for the Situationists, the construction and deconstruction of situations, for Sholette a Nietzschean inspired “shadowy ressentiment” (113), albeit representing a possible alternative to the passivity, isolation, and political death of those who acknowledge the central paradoxes inherent in our time. The most insightful chapters in Dark Matter for this reviewer are those that attend to Sholette’s dual [ethnographic] role as artist/activist and participant/observer. Much of the author’s primary information on political art groups and collaborative art projects is discussed at length in Chapter 7. “Mock Institutions” is a richly augmented discussion with information gleaned from responses to an art group survey (with 67 from 211 respondents) undertaken in 2008 that is also graphically displayed (164-165) and appended to this volume. The survey questions directed at these groups were arraigned under four separate headings: Basic Information, Relationship to the Art World, Organizational Structure, and Reasons for Working in a Group or Collective. Sholette’s survey indicates a wide range of responses, from politically sophisticated to the startlingly naïve. Sholette distinguishes perhaps unfairly between “the dour leftist artists of the 1960’s, 70’s and early 80’s” to illustrate how new artist groups such as The Yes Men, Carbon Defense League, and Applied Autonomy provide “plagiarized factories, mock corporations and ludic clown armies” in their pursuit of critical agency. He further indicates that these mock institutions are “indifferent to proper organizational structure [and] that they adopt any convenient form of governance” (161). The author concludes that “one could say a certain deregulated aesthetic is the ‘new normal’ in an age of enterprise culture” (ibid) and argues that “corporate plagiarism has become synonymous with the practice of Tactical Media.” This parodistic dissimulation can be redeemed politically if as is the case of The Yes Men, the art groups align their spectacular actions with the objectives of specific NGOs and social justice groups, exactly Marx and Engel’s claim to resist political tendency. In their broadside against the Young Hegelians and speculative philosophy in “The Holy Family” (1944) Marx and Engels argued that socially informed cultural practice could be identified as either liberal altruism, or as leftist tendenzkunst – and perhaps both. Like Marx's criticism of this "wretched offal of socialist literature" the ‘critique of critique’ tendenzkunst argument insists that while evidencing the ‘correct political tendency’ the artwork remains still at the level of representation, merely acting out the forms of cultural politics without providing the important political substance that would engender real change. Armed with the legacy of Marx, Engels, Walter Benjamin, György Lukács, et al., many on the left including Sholette would argue that the artist/intellectual should align him/herself with the appropriate progressive or revolutionary forces within society and their representative social groups and political parties. Like Marx and Engel's critiques of Ferdinand Lassalle and Eugene Sue, much contemporary Dark Matter art practice could also be criticized for evidencing the correct political tendency but lacking the correct engagement with its object of concern, which would arguably necessitate an adoption of the appropriate (time honoured), and normative political strategies for social change. The Occupy movement has been criticized by some for being tendentious, lacking exemplary leaders, guiding principles or a clearly defined political philosophy or allegiance. Dark Matter is richly illustrated with primary research information on political organizing, its successes and failures, as well copious examples of the strategic and tactical roles the media — culture — can play in social change. Sholette provides several effective strategies for the development of an authentic political praxis in the neoliberal age of enterprise. Perhaps the occupy and art groups political praxis could begin with ‘whatever’ as the ethical ground for the potentiality of a party without party. “I prefer not [to]….” says Herman Melville’s Bartleby the scrivener, three times. This famous speech act constitutes the ur text “what if/ever – potentiality” of Italian philosopher Giorgio Agamben’s ethics for the contemporary philosopher (as) scrivener, the one who like the party without party member may engage in “an experience of the possible as such” (Potentialities 2000: 249). Does this privileging of potentiality in the political process coincide with the renunciation of the creative will to power in Guy Debord’s famous line from his film Critique de la separation (1960-1)? “I have scarcely begun to make you understand that I don’t intend to play the game”…at least, one could or perhaps should add, “not in the usual way.” And yet creative negativity in the Nietzschean sense is an act of will, is it not? And if action speaks louder than words as we understand it in the vernacular sense, then perhaps preference (I prefer not) is an illocutionary act that infers the actual (result) of the speech act as a whole. This was certainly recognized as such by the receiver of Bartleby’s ‘communication’ – the man of the law! This is also a structure versus agency issue (debate/debat) n’est pas/nicht? And this claim is necessarily one that the contemporary philosopher, artist or politician may identify as an aporia for the continuance/maintenance/potentiality of philosophy, art and politics as modes of institutionalized discourse. Taking his cues from Aristotle’s Metaphysics “thought thinking itself, that is a kind of mean between thinking nothing and thinking something, between potentiality and actuality” (251), Agamben affirms the anaphorized potential of Bartleby’s speech act: “I would prefer not to prefer not to…“ (255). He follows with a discussion that presents the proposition that “the aporias of contingency…are tempered by two principles” (261). The first secured by the “irrevocability of the past” and the second, “conditioned necessity” both of which are contingent upon one another. What if conventional party politics, partisanship, and left/centre/right divisions were a thing of the past? This is certainly a tactical media question for the present that the author of Dark Matter reinforces in his conclusion—the apotheosis of dark matter—that must rise from the “the dawn of the dead” (188). Agamben, Giorgio. Potentialities: Collected Essays in Philosophy. Stanford: Stanford University Press, 1999. Ed. and Trans. Daniel Heller-Roazen. Print. Agamben, Giorgio. Means Without End: Notes on Politics. Minneapolis: University of Minnesota Press, 2000. Print. Benjamin, Walter. The Arcades Project. Trans. Howard Eiland and Kevin McLaughlin. Cambridge, Mass. : Harvard University Press, 1999. Print. Benjamin, Walter. The Origin of the German Tragic Drama. Trans. John Osbourne. London: New Left Books, 1977. Print. Butler, Judith, Ernesto Laclau, and Slavoj Žižek. Contingency, Hegemony, Universality: Contemporary Dialogues on the Left. New York: Verso, 2000. Print. Derrida, Jacques. The Truth in Painting. Trans. Geoff Bennington and Ian McLeod. Chicago: Chicago University Press, 1987. Print. Bruce Barber is Professor of Media Arts, Historical and Critical Studies at NSCAD University, Halifax, Canada. He is the author of Trans/actions: Art, Film and Death (2005) and Performance [Performance] & Performers (2007); editor of Essays on [Performance] and Cultural Politicization (1983) and Conceptual Art: the NSCAD Connection 1967-1973 (1992); co-editor, with Serge Guilbaut and John O’Brian, of Voices of Fire: Art Rage, Power, and the State (1996). His critical essays and reviews since 1972 have appeared in numerous book anthologies, journals and magazines. Barber’s artwork is included in various private and public collections in New Zealand, Canada, Australia, Poland and the United States.